Back Again! 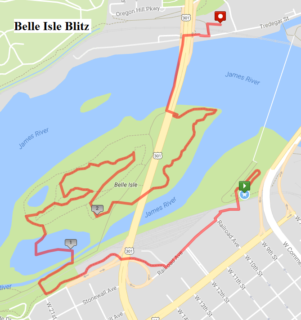 The Belle Isle Blitz is chip timed trail run. A 5k-ish trail race with a similar course as the Filthy 5k-ish but no mud pit so you can spend your time focusing on the trails! Sign up for the Dog Wave, a part of the Belle Isle Blitz, and bring your favorite canine through the trails, along the dry way, and across the river. There’s no better way to spend a Friday night than with man’s best friend! Less actual mud not guaranteed. Want to add some extra intensity to your Dominion Energy Riverrock experience? Try out one of our challenges! All participants must be at least 7 years old to participate. We ask that all children under the age of 14 be accompanied by an adult. The Belle Isle Blitz utilizes wave starts in order to control volume on the trails, so you will be asked to line up for the start based on your predicted pace. The Dog Wave will be the final wave of the race.